5 September 2011- New York, NY- NYC Councilwoman Letitia James at the 44th Annual West Indian Day Carnival held on Eastern Parkway and the Brooklyn Museum on September 5, 2011 in Brooklyn, New York. © Terrence Jennings / Retna Ltd. Photo: ? Terrence Jennings / Retna Ltd./? 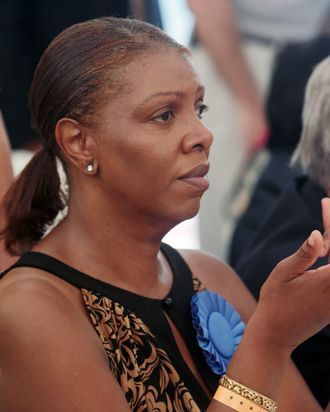 Terrence Jennings / Retna Ltd.
Tragedy struck the office of new Public Advocate Letitia James as one of her senior staff was found hanged to death in his Crown Heights apartment Thursday. According to the New York Post, police found Alfred Chiodo’s body after his coworkers asked them to check on him after he missed a few days of work. Chiodo was James’s urban-affairs director, and worked on issues such as her opposition to the Atlantic Yards development. He was 57, and according to a neighbor, lived alone with his cat.